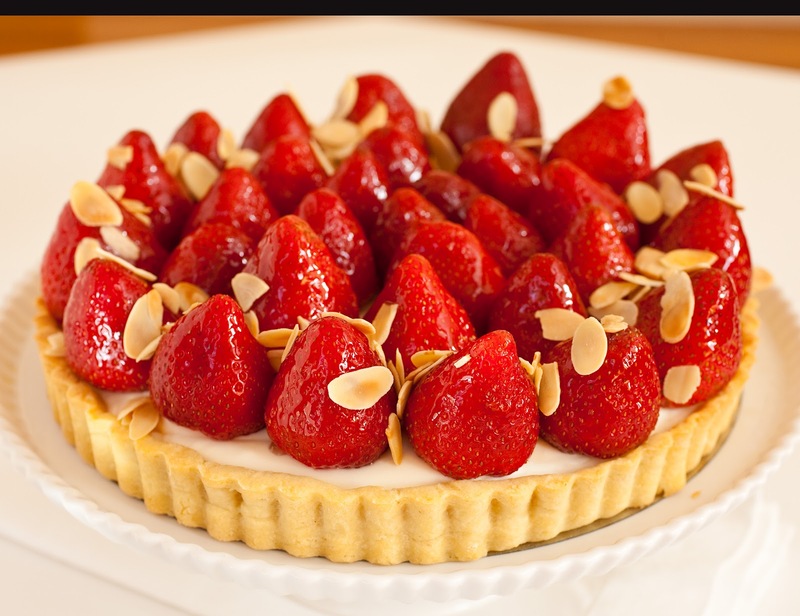 strawberry jam to give them a jewel-like finish, and sprinkle toasted sliced almonds around the tart’s edge. 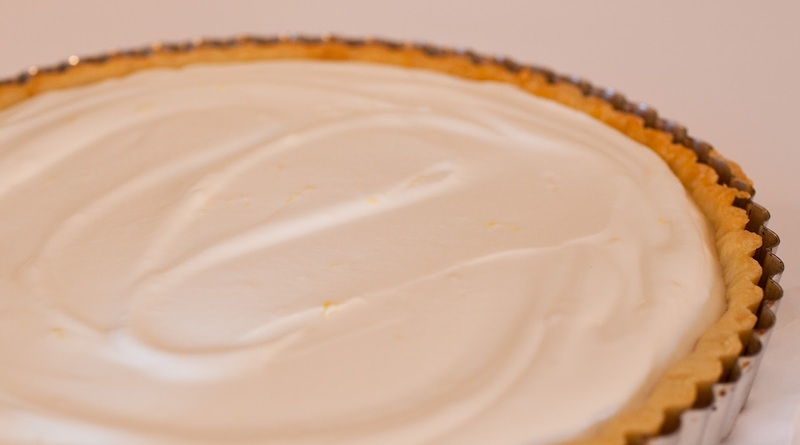 This pretty, spring tart has all the flavor of the original cheesecake, but it’s a lot easier to make, leaving more time to enjoy this lovely spring weather we’ve been having. And it also makes a wonderful dessert to honor Mom on her special day. Happy Mother’s Day!! 1. In a medium bowl, whisk together the flour, almond flour and salt. 2. In the bowl of an electric mixer fitted with the paddle attachment, beat the butter with the confectioners’ sugar at medium speed until well blended. Add the egg yolks, mixing until blended and scraping down the sides of the bowl as necessary. While mixing at low speed, add the flour mixture in two additions, mixing until just blended. Turn the dough out onto a work surface and shape into a disk. Wrap the dough in plastic and refrigerate for at least 1 hour. 3. Preheat the oven to 350°F. Place the unwrapped dough on a work surface that has been lightly dusted with flour. Using a rolling pin, roll the dough out into an 11-inch circle, lifting and rotating the dough often, while dusting the work suface and dough lightly with flour as necessary. Roll the dough up on the rolling pin and unroll it over a 9-inch fluted tart pan with a removable bottom. Gently press the dough onto the bottom and up the sides of the pan. Roll the pin over the top of the pan to trim off the excess dough. Lightly prick the bottom of the dough with a fork at 1/2-inch intervals. 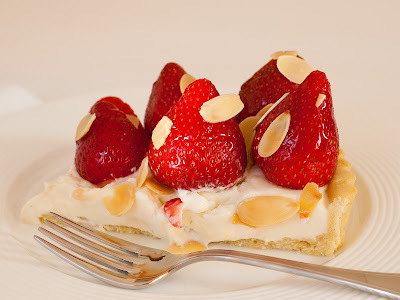 Place the tart shell in the freezer for 10 minutes. 4. Line the tart shell with aluminum foil or parchment paper and cover with pie weights or dried beans. Place the tart pan on a baking sheet and bake for 20 minutes. Carefully lift the foil (along with the weights) out of the tart pan and bake the crust for 6 to 7 minutes longer, until golden around the edges. Transfer the tart pan to a wire rack and cool completely. 5. Place the water in a small container. Sprinkle the gelatin over the water and set aside to soften. 6. Place the milk, the sugar, and cream cheese in a medium saucepan over medium-low heat. Cook, whisking constantly, until the cream cheese melts and the mixture is smooth, about 3 minutes. Add the gelatin mixture and whisk until the gelatin is dissolved. Pour the mixture through a fine-mesh sieve into a medium bowl. Whisk in lemon zest and vanilla and cool to room temperature. 7. 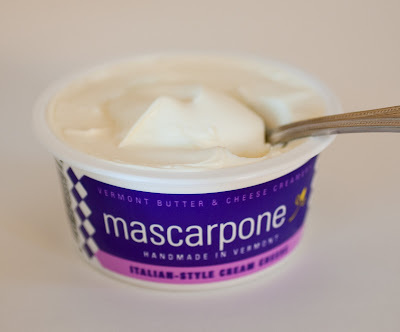 In the bowl of an electric mixer, using the whisk attachment, beat the cream and mascarpone cheese or yogurt at high speed until the mixture just begins to form soft peaks. Add the cooled cream cheese mixture at low speed. Increase the speed to medium and mix until the mixture is well blended and smooth. Scrape the filling into the prepared pan, over the crust, and refrigerate for at least 2 1/2 hours, until set. 8. 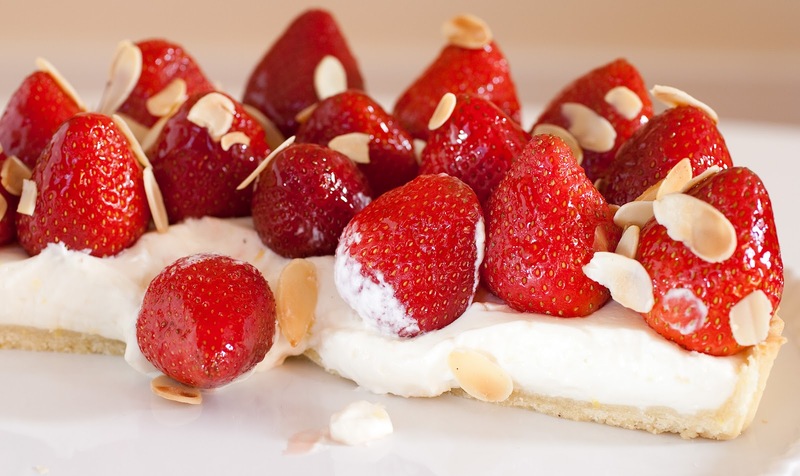 Arrange the strawberries, pointed side up on top of the filling, covering it completely. Place the jelly in a small, microwave-safe cup and heat in the microwave for about 20 seconds, until melted. Brush the warm jelly over the strawberries. Sprinkle the edge of the tart with the toasted sliced almonds. 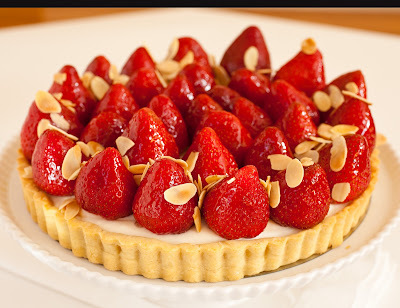 Refrigerate the tart for 20 minutes before serving.